The quarter final line-up is now complete after the final first round matches in the 2014 BC Provincial Cups were played out on Sunday. Defending A Cup Champions Surrey United Firefighters were made to work hard to overcome a dogged Vic West FC side, coming back from being a goal down at the half to eventually secure their quarter final spot with a 2-1 victory. The win keeps Surrey’s dream alive of a threepeat and if they are to pull it off, they will become the first team to do so since Victoria West achieved the feat themselves with four back to back A Cup triumphs between 1979 and 1982. It was a run that was actually ended by Vancouver Firefighters in 1983. It was a relentless display from Surrey United, who dominated the game from start to finish and launched wave after wave of attacks against a Vic West defence that stood firm and dealt with pretty much everything that the Firefighters were throwing at them after taking a shock early lead. Watching the match felt like a playground game of attackers and defenders at times, with seemingly no respite from the home side’s attacks, especially in the second half. Surrey went at it from the off and had a couple of early chances. Angus Burke had the ball in the back of the net in the 11th minute, but it was called back for a handball. Vic West then took the lead two minutes later in freak fashion. The VISL side won a free kick just inside the Surrey half and Drew Brittain hit a high and hopeful ball towards the home goal which then took a bounce in the box and flew over the head of Andrew Fink and into the back of the net. It was certainly a shock to those watching and only spurred Surrey United into turning up the heat. They took the game to Vic West for the rest of the half but despite enjoying the vast majority of the possession they couldn’t make their pressure pay and carve out any clear cut chances. A combination of strong defending and plays breaking up when they reached the box saw Vic keeper Hide Ozawa with no real saves to make. His compatriot at the other end was basically a spectator by this point bar for a few forays forward from the Victoria side. Sean Einarsson was looking lively for Surrey and posing problems for the Vic defence, coming close in the 39th minute but firing just over. The visitors had a couple of ventures forward to kick off the second half before Surrey took over once again and lay siege on the visitor’s goal. They got their reward in the 55th minute when Vic West failed to properly clear a low cross and Einarsson buried the breaking ball high into the net from just inside the box giving an acrobatic Ozawa no chance. The home side nearly took the lead a minute later when Stefan Leslie’s misshit cross forced former SFU Clan keeper Ozawa to tip the ball over. Vic defended resolutely as Surrey pressed hard and had, and squandered, numerous chances to take the lead before finally going ahead with six minutes of the match remaining. Tom Lowndes was given too much space and time in the box and his bobbling shot took a bounce on the grass and somehow got through the last defender and keeper and into the net. Vic West were now forced to push forward and were leaving space at the back. Surrey should have killed the game off but wasted a couple of late chances and had to settle for the narrowest of wins, but they all count at the end of the day. You can see both of Surrey United’s goals and some other very brief highlights in the video below. Surrey’s win now sees them make the short trip to face FVSL side Langley United in the quarters. Although they battled hard, Vic West’s defeat leaves Bays United as the only VISL side left in the A Cup competition, with five VMSL sides and two FVSL teams making up the last eight. 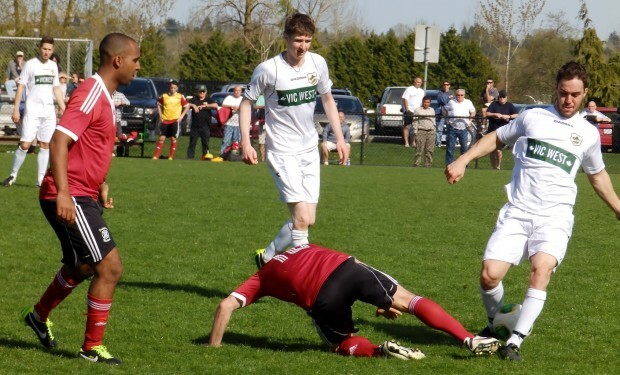 Bays United saw off PCSL entrant Kamloops Heat 2-1 on Sunday afternoon, whilst VISL champs Saanich Fusion went down to a heavy 4-1 defeat to Metro-Ford Wolves, and those pair will square off in the quarter finals in Coquitlam. In Sunday’s two B Cup matches, BMSA side Bacardi FC saw off Richmond side Jugadores 3-0, whilst Richmond Athletics headed to Vancouver and won a tight game 1-0 against NK Hrvat. You can find all of the results from the weekend’s action in the A Cup, B Cup, U21s, Masters and Women’s competitions over on the BC Soccer website. The competitions sit out the Easter weekend next week but will be back for the quarter finals on April 25th to 27th. We’ll bring you full coverage once again on AFTN and hope to see you at some games.